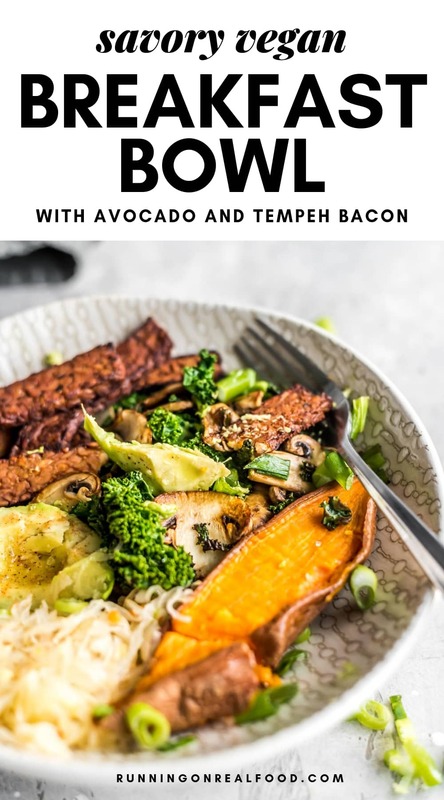 These Vegan Tempeh Bacon Avocado Breakfast Bowls are filling, balanced and full of nutrition to help start your morning right. This recipe is naturally gluten-free, whole food plant-based and a good source of fiber, protein and healthy fats. Tempeh bacon is so easy to make. All I use to make it is soy sauce, pure maple syrup (use can use stevia for sugar-free), garlic powder, salt and pepper. I thinly slice the tempeh and let it marinate for 10-20 minutes then either broil or cook in a pan until crispy. That’s it! As much as I love oatmeal, pancakes and smoothies, I know that savory, low-sugar breakfasts work so much better for me. In comparison to sweet breakfasts, they keep me fuller longer, keep my blood sugar more stable and reduce or eliminate my sugar and carb cravings throughout the day. I feel way better when I start my day with a fat, protein and fiber-rich breakfast that’s low in sugar. When building healthier breakfasts, think about including a source of carbohydrates, protein and fats. 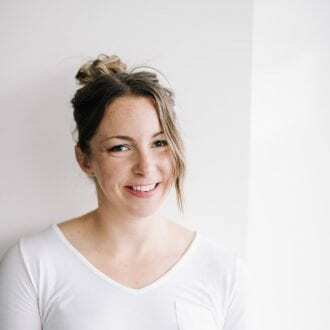 Healthy, complex, low-GI carbohydrates provide energy while the protein and fat help slow digestion and keep your blood sugar levels more stable as you digest your food. 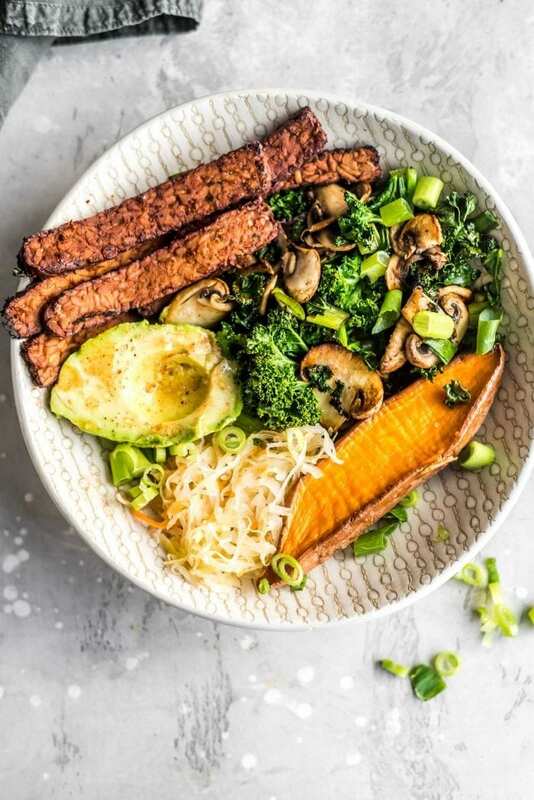 This avocado breakfast bowl is the perfect combination of carbs from the sweet potato, protein from the tempeh and fats from the avocado. 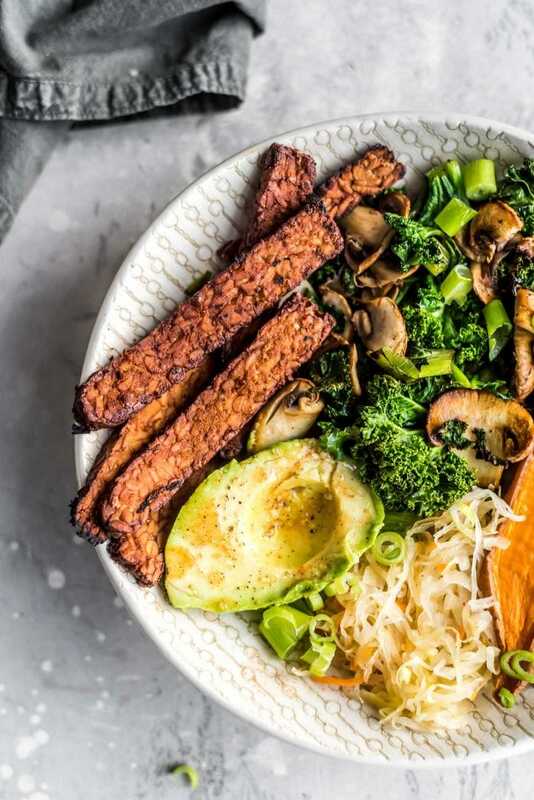 To make this delicious plant-based breakfast, start by marinating the tempeh. While that sits, chop the veggies and start cooking them in a skillet. Get the tempeh in the oven on broil for about 10 minutes until crispy then load everything into a bowl and enjoy. I called this a breakfast bowl but it can really be enjoyed any time of day. It also packs up well for meal prep if you want to make a few in advance for healthy breakfasts during the week. 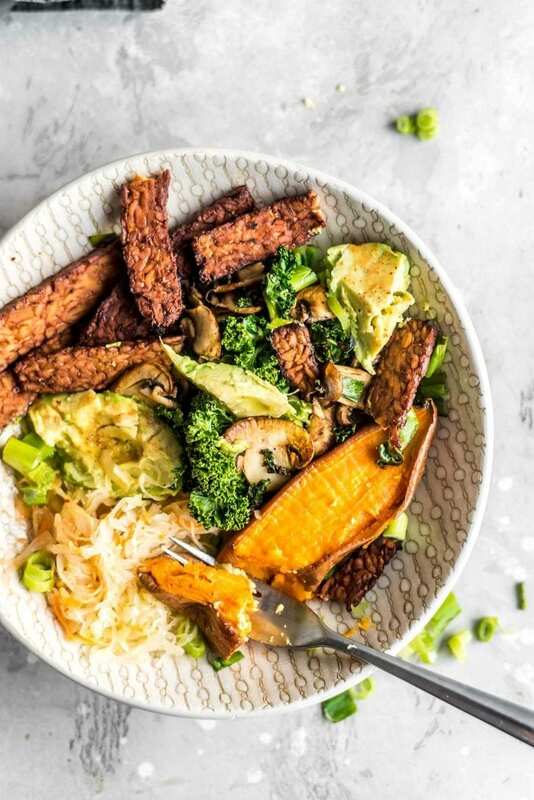 To speed this dish up, I cook the sweet potato in advance as part of my Sunday meal prep. 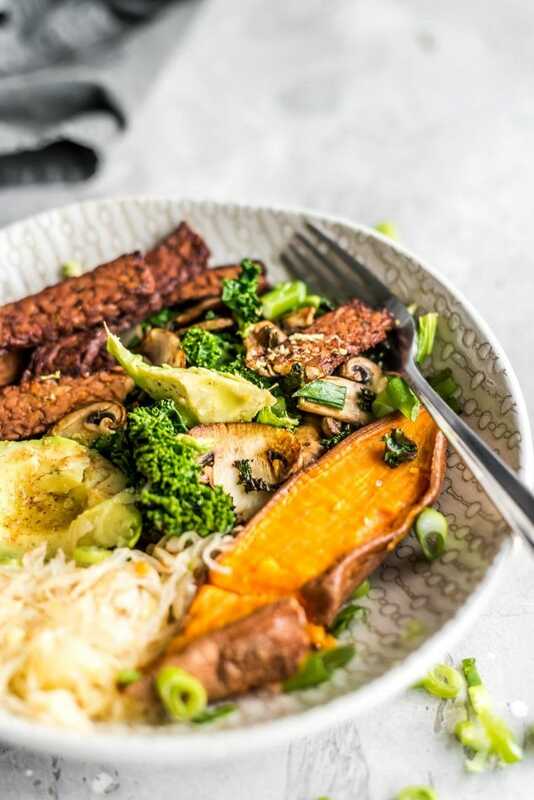 If you don’t have baked sweet potato ready to go, you’ll need an extra 30-40 minutes to make this. This bowl is rich in healthy fats from the avocado, especially the monounsaturated fatty acid, omega-9. Avocado is also a good source of potassium. The sweet potato provides an antioxidant, fiber and nutrient-rich source of unrefined, complex carbohydrates. 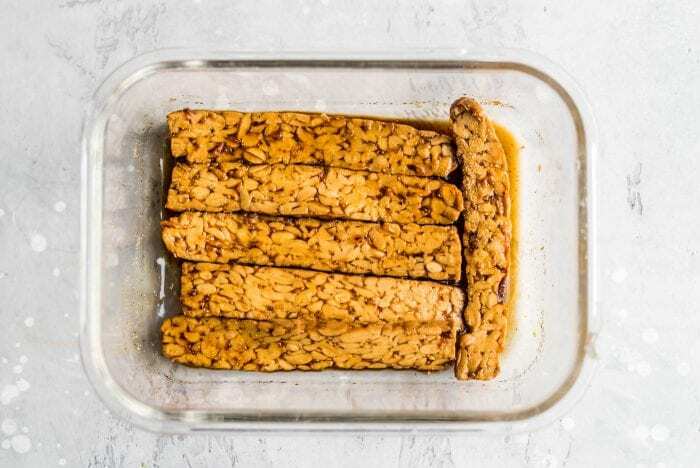 The tempeh adds plant-based protein and is a fermented food that’s good for gut health. Kale is one of the most nutrient-dense foods you can eat and adds a ton of nutrition to your morning. This bowl is fairly low in calories considering how big and filling it is. Each serving provides 397 calories with 22 grams of plant protein, grams of f15 at and 399 grams of carbs, along with 10% of your daily iron, 15% of your daily calcium and 80% of your daily vitamin C. It’s also a good source of vitamin A. These savory breakfast bowls will fill you up and provide all the energy you need for a busy morning. They’re rich in protein, healthy fats and fiber for a well-balanced vegan breakfast that won’t spike your blood sugar. To make the tempeh bacon, place the sliced tempeh in a shallow dish and add the rest of the bacon ingredients. Tilt the dish to coat each piece of tempeh. Let it sit for 5-10 minutes, the flip the sliced tempeh and let it sit another 5-10 minutes. In a pinch you can skip marinating it or if you have more time, let it sit up to an hour. Once it’s marinated for about 20 minutes, place the strips on a baking tray and bake in the oven at 450 F until crisped. You can also broil on a rack for 5-10 minutes, flipping every couple minutes until they’re crisped. While the tempeh bakes, make the kale and mushrooms. Add the mushrooms and avocado oil to a skillet and cook over medium-high heat, stirring every couple minutes until the mushrooms are starting to brown. Add the kale and green onions and cook for a few more minutes until the kale is soft and the green onions are wilted and browning. To assemble the bowls, add the cooked mushrooms, kale and green onions to a bowl along with as much avocado as desired, half a baked sweet potato (or more, if desired) and the tempeh bacon strips. Add a scoop of sauerkraut or kimchi, if you want. Season the bowl with a pinch of salt and pepper and enjoy right away or pack up as part of a meal prep. I make the sweet potato for this in advance to speed things up. To make it, cut a medium-sized sweet potato in half and roast at 425 F, cut-side down on a baking tray until easily pierced with a fork. I use parchment paper or a silicone baking mat for easy clean up. This should take about 30 minutes but may be longer depending on the size of the sweet potato.